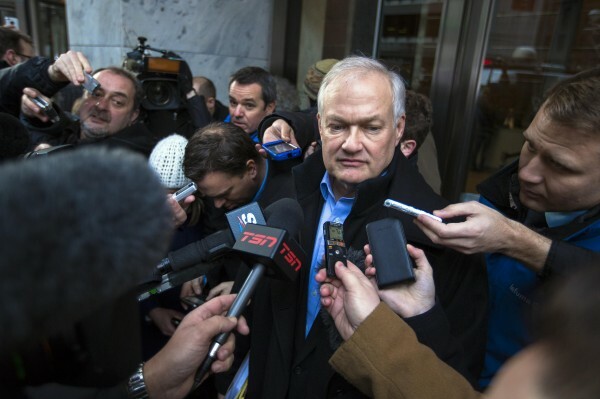 National Hockey League (NHL) Players' Association executive director Donald Fehr speaks to members of the media after dropping off a proposal at NHL headquarters in New York, on Jan. 2, 2013. NHL.com announced Sunday morning that after 16 hours of negotiations, the league reached a deal with players. The National Hockey League and locked-out players reached a tentative agreement on Sunday to end a costly labor dispute and salvage a condensed season that was days away from being canceled entirely. The deal was announced jointly by NHL Commissioner Gary Bettman and NHL Players’ Association Executive Director Donald Fehr following a marathon 16-hour negotiation session that began on Saturday at a Manhattan hotel. “We have to dot a lot of I’s and cross a lot of T’s. There is still a lot of work to be done, but the basic framework has been agreed upon,” Bettman told reporters. Bettman said details on the upcoming season could be released later on Sunday and some reports suggest a 50-game season, down from the usual 82 games, could begin Jan. 15. News of the tentative deal came just days ahead of the NHL’s self-imposed Jan. 11 deadline to reach an agreement or risk losing a season that was originally due to begin last October. With talks unraveling and the NHL on the verge of canceling the entire season, the 113-day lockout ended with the help of a U.S. federal mediator who enticed the two parties back to the bargaining table for a final push to make a deal. The return of the NHL created an instant buzz across hockey-mad Canada, with even Canadian Prime Minister Stephen Harper greeting the news with relief. “Glad to see a deal between the #NHL players and the league. Great news for hockey fans and communities across Canada.” Harper tweeted. However, many teams, particularly those based in the United States, are bracing for a fan backlash while owners and players begin to calculate the damage done by the 113-day lockout. The dispute, which the league has said was costing it about $18-$20 million a day, began in mid-September when the previous collective bargaining agreement expired with both sides at odds over how to split the NHL’s $3.3 billion in revenue. Despite a new $2 billion television deal, record revenues and Bettman’s boast that the NHL was enjoying unprecedented popularity, owners decided to once again test the loyalty of sponsors, business partners and fans suffering from lockout fatigue by seeking more concessions from players. The dispute, which marked the NHL’s fourth work stoppage in 20 years and first since a lockout wiped out the entire 2004-05 campaign, is the second longest by the NHL and players and it is expected that fans could be slow to return to the arenas. “It’s going to be tough, especially for some of the smaller market teams but at the same time hockey is one of the most exciting, if not the most exciting, game in the world and we have great passionate fans and they are very knowledgeable about the game,” said Tampa Bay Lightning’s Steven Stamkos, the NHL’s leading goal scorer last season. With the two sides reportedly settling on a new 10-year deal with an opt-out clause after the eighth year, fans may not have to concern themselves about another work stoppage for a decade. Other details of the agreement to emerge will see the salary cap for the 2013-14 season set at $64.3 million. The NHL had been seeking a $60 million cap while the NHLPA was seeking $67 million. The cap floor, or the amount of money each team must spend, will be set at $44 million. The owners won a 50-50 split of revenues, compared to the 57 percent players received under the old deal, and got limits on contract lengths. Term limits for free agents will be seven years and eight years for a team signing its own player. There are still many details to be filled in, including drug-testing and whether the NHL will continue to participate in the Winter Olympics. With news of a tentative agreement in place, the hundreds of players who chose to ride out the dispute playing in European leagues must immediately join their NHL clubs for an abbreviated training camp. There is also much work ahead for teams, who must quickly digest the new CBA and the rules they will operate under while filling out rosters. New Jersey Devils netminder Martin Brodeur, who has endured three work stoppages during his career, said NHL players are prepared to put on a good show to win back disgruntled fans. “I think for the fans it is going to be pretty exciting,” said Brodeur. “Coaches know you can’t afford to lose many games because a streak of three or four games winning or losing is going to decide whether you are going to end up in the playoffs or not make the playoffs.